Jack Lew sees good signs for the economy both on Capitol Hill and Main Street. And his message to the rest of the world: there's work to be done. The Treasury Secretary said he is encouraged by Congress, which in recent months agreed on a budget, spending bill and debt limit measure. "Maybe -- just maybe," Lew said, "we'll be able, for a couple of years, to keep doing business that way." 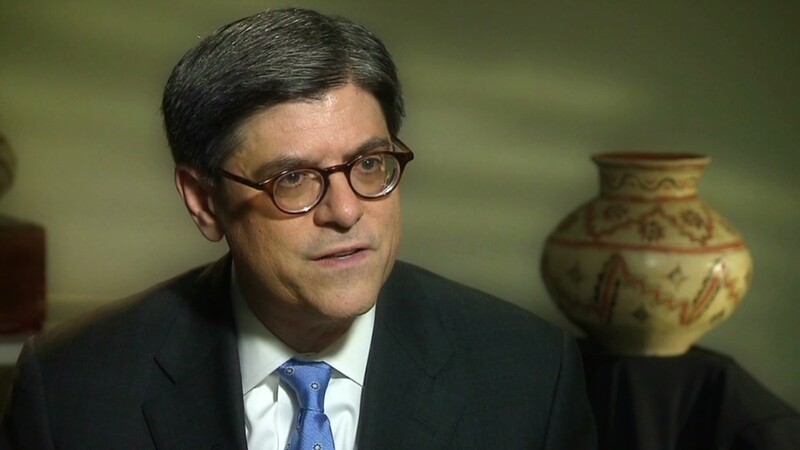 By handling these matters, Washington is sending a worldwide message, one Lew says he'll bring to a gathering of global financial leaders this week in Australia. 1. Thanks, Washington: Last year's government shutdown and the brinkmanship before it took a toll on the economy. But what matters is that Washington is getting its act together. "The last four months have been very different from the prior two years," he said. "You look at the economic growth over the last six months -- (there's a) decided arc of progress," he said, specifically citing "sustained job growth." But Lew acknowledged room for growth. The numbers support that: hiring in December and January was weak and far below expectations. 2. Confident in immigration reform: Lew expressed great optimism that immigration reform could be accomplished "at some point in the not that distant future." "I don't know if it's the next few months or the next year or two," he said. He acknowledged that the election year could dampen prospects but noted reform is "in the political interest of all parties" and the economy. "Immigration reform will even help us deal with the entitlement issues because it grows the economy," he said. "It grows the payroll tax base, and it helps to support Social Security and Medicare financing." 3. But less optimistic on the minimum wage: But less likely to move forward, he suggested, is an increase in the minimum wage. "We're going to keep working at it," he said. "It's obviously not in our power to force Congress to act, but we can make the case for it and we can have the American people make the case for it and we're going to continue pressing." Washington Democrats have argued for increasing the minimum wage to $10.10. But most congressional watchers consider that unlikely to pass. After pushing the issue in his State of the Union address, President Obama ordered federal contractors renewing their agreements with the government pay employees at least $10.10. Both critics and proponents of a minimum wage increase took something away from a Congressional Budget Office report this week. It found a wage increase would eliminate around 500,000 jobs but also bring 900,000 out of poverty. "I don't believe that it's right for people to work for 40 hours and take home pay that's below the poverty line," Lew said. 4. Step up, world: The G20 conference of financial system and central bank leaders gives Lew an opportunity to speak about recovering economies in Europe and emerging markets, which have seen turmoil as the U.S. economy has improved. He pointed to the economic collapse in 2008 and 2009 to underscore how the world's economies are interconnected. "The collapse of Lehman proved that when a major financial institution fails, it's not confined to one country," he said. "I think that our message to the world will continue to be the rest of the world needs to look at what can it do to promote growth," he said. "We're going to do our part." 5. Bitcoin regulations likely coming: It seems the time of unregulated virtual currency is coming to an end. Lew didn't tip his hand, but said the innovation of Bitcoin must be balanced with legal ones. "As a policy matter, what we have to look at across all the different forms of payment is that the same rules apply, it's a level playing field," he said. "Just as with cash or checks, if there's virtual currency or online payment methods, they'll have to comply with all the same laws that everybody else complies with. It's not going to be OK to do illicit activity, whatever form of currency you're using." His comments come as the online currency is on a roller coaster -- and not for the first time. Some transactions have been halted after hackers exploited a major security vulnerability.